With pain in my heart I come to inform you that unfortunately that there won´t be a next edition of Tropicalia Bazaar. When planning any type of business in Second Life, we are exposed to obstacles of real life. Businesses come and go in SL with speed. We are hostages of the RL, as it is the priority. New challenges came in real life: a new job where I have to dedicate myself full time and the result is that since last month I’m unable to login with the same frequency. This implies not being able to manage the bazaar as I would like, to create products for it, disclose, maintain and organize. I want to log into Second Life just to relax, be with friends, take some pictures and have fun without compromises in the short time that I have for it. I am now focused on my RL. I am extremely grateful to each of you who believed in the project, who dedicated time and creativity to the Bazaar. Special thanks to Poulet Koenkamp (PurpleMoon Creations), our primary motivator and responsible for most of the success of this project. Malu Mayo (Reale) who gave us the land without charging any linden in return. I also thank Maja Signa (Loordes of London), Cindy Oysternatz (Censored) and Fanny Willis (Everglow Poses) that have never failed any edition since the first one in August last year. Shinya Tandino (Celestina’s) sponsorship, Thereaver Barrymore (Magenta) for having published six beautiful issues of the Tropicalia Magazine and bloggers who contributed to spreading the bazaar, especially Analy Amat (beauty SL), LuaFlor Moo (flordalua style) and the girls from seraphimSL. I hope it was helpful to each of you, as it was for me. Special thanks to Stu Reyes, my perfect partner and primary founder of the bazaar, I know how much you were commited and how much you supported our project, but like me, you don’t have enough time to maintain the Bazaar. p.s. The current edition is avaiable until 20th may. Beautiful earrings by Censored exclusively for Tropicalia Big Bazaar members. 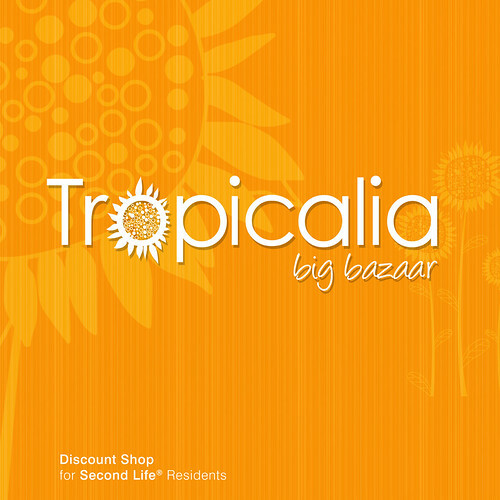 Join in Tropicalia Big Bazaar group and active your tag to receive them. Everything is new! New store, new designers, new produtos, new everything! I love to see our own progress. 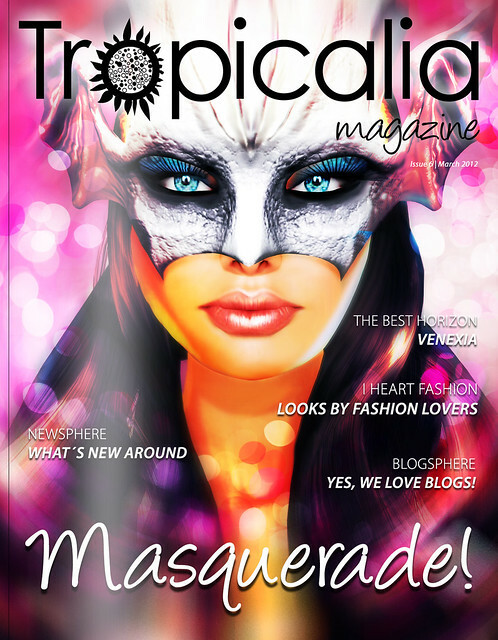 We have reached the sixth issue of Tropicalia Magazine! A few days ago we celebrated carnival so why not use this celebration as a theme for this issue? Real life carnival celebrations, especially Venice Carnival, inspire and entice us to recreate the same in Second Life.Check out great looks created by the dearest Laylinha Tomsen, MokaTana Boa, Stu Reyes and Vick Spitteler in “I ❤ Fashion”. Vick also presents us some of the new releases of our “Tropicalians” in “Newsphere”. Discover also four blogs not to be missed in “Blogsphere”. Silton Mindes went to one of the most visited lands of the moment and it has everything to do with our theme: Venexia. If you want to know Venexia, grab a visitor's tag, as it is an RPG land. And don’t forget to take a look at the selected pictures in “That Tropicalia Feeling”. A big kiss to all and happy reading! Click in the picture to read it!